Nothing is ever FREE, as the age old adage goes, and if it is free there is usually a catch, or its about as good as a screen door on a battleship. In regards to free plugins there are many options out there, many of which dont actually fall into the ‘whats the catch’ category but often times lack the quality to become a staple of your production work flow. Having said this, there is the odd exception and like an unexpected first class upgrade iZotope’s Vinyl Simulator, AfroDJMac’s Electric Guitar Synth and TAL’s U-NO-62 mean we can live the high life without breaking the bank. As the name suggests this plug in is designed to retro grade our digital masterpieces and give them that authentic lo-fi vinyl texture through a variety of adjustable controls, in particular: Mechanical Noise, Wear, Electrical Noise, Dust, Scratch and Warp Depth. With the exception of wear all of these sounds can be tested and balanced before playing any audio through the plug in, which enables you to preview their different qualities and configure the type of sound you are looking for without being distracted by the main track. Having said that you may need to tweak your settings once the audio is playing. 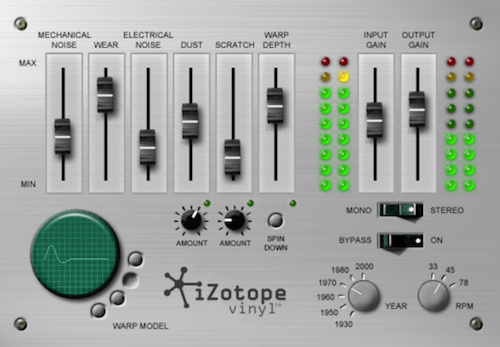 In addition to the controls mentioned above you can also; tweak the oscillations of the warp function by selecting one of four wave forms, create an authentic slowing vinyl effect with the spin down button and with use of the year button, which is effectively a filter, you can give your sounds an even greater lo-fi quality. Overall we found the main controls and the spin down button really effective as we were able to create subtle and extreme lo-fi textures without things sounding too digital. Our only reservation was the overly predictable scratch function and the slightly weak filter or year button. We stumbled across this plug-in whilst trying to find a set of authentic sounding guitar sounds for a track we were currently working on. As with any of these plug-ins if we had the time, facilities and money to avoid a digital emulation we would, but sometimes you just need to get your ideas down and AfroDJMac’s ‘Electric Guitar Synth‘ is the ideal companion. All the sounds are actual samples recorded through his Fender Mustang and as you will see in the accompanying 10 minute YouTube tutorial each sample has been made expertly customisable. Overall this is a great guitar synth that has plenty of scope for customisation and jamming, the samples sound great and although you are essentially limited to one guitar sound, the Fender Mustang, this synth should get the juices flowing and perhaps inspire you to sample your own guitar or any other instrument you may own. Plus, unlike many musicians ‘Electric Guitar Synth’ doesn’t have an opinion, so any chord progression changes are easily negotiated. Whether you have just started making electronic music or have been writing for some years you will most likely all end up at the same destination, ‘VintageSynth.com‘, followed by eBay. Unfortunately, like many before you, those dreams of getting your hands on a classic vintage synth are unceremoniously dashed when the realisation that affording one would mean not eating for a year. 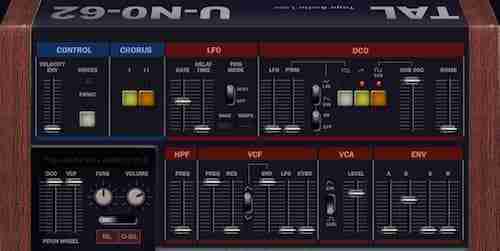 But all is not lost, because if the Juno 60 was one of those synths on your list then this free emulation is going to blow your mind. Not only is it free, it sounds incredible, and when compared to the original its like trying to blind taste home brand coke and coke, virtually indistinguishable.